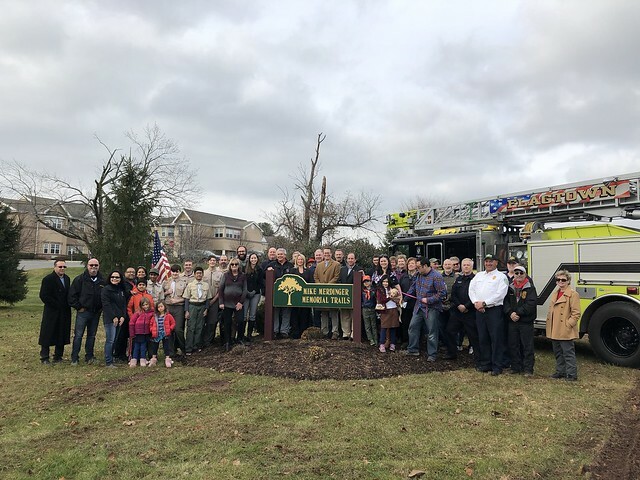 Last Saturday, 29 East Mountain Road was the backdrop for a gathering of the Hillsborough Community to unveil the Mike Merdinger Memorial Trails sign and officially dedicate the area to the former Mayor and Administrator. His wife Barbara was joined by their daughters Kristin, her husband John and daughter Megan, her husband Patrick and their children Minna and Theo. Mayor Gloria McCauley welcomed guests including Senator Kip Bateman, Deputy Mayor Doug Tomson, and Committeeman Carl Suraci. Flagtown Fire Company, from which Mike was a long time member, brought a ladder truck to honor their friend. Mike Merdinger served Hillsborough Township as a dedicated civil servant and held many key positions within the community. He served on the Township Committee in 1979 and again in 1981 through 1984 and served as the Township’s Mayor in 1984. Over the years, he also held the positions of Township Administrator and Acting Township Clerk.